India Vix, India’s Volatility Index, shows negative correlation with the Nifty which makes it a great hedging tool. I tried to find out the correlation between these two indexes. For the year 2010, the correlation comes out to be -0.92. So, traders can almost perfectly hedge there positions in nifty. However, the hedging strategies can only be finalised once the Futures and Options in indiavix are introduced by NSE. It will depend on the lot size of india vix and other parameters like liquidity and margin requirements etc. The Vix options in US markets are great hit and i hope the same for indian markets aswell. The India Volatility Index (India Vix) has lately hit the new all time low from the time of its start. On Aug 18th, 2010 India Vix has hit a new low of 16.40 which is even lower than the half of the year’s high of 34.37 on 25th may 2010. This may be a good news for retail investors as the volatility in the indian share market has subsided which indicated lower fear level among the investors and which may also trigger fresh foreign investments into india. Volatility index, popularly also known as the fear index, predicts the possibility of sharp movement in the stock market. The lower value of 16.40 indicates lower probability of some major swing in the stock market. India Vix was started by national stock exchange (NSE) in March 2009 and it has quoted the highest value of 56.07 on 19th may 2009 and the lowest value of 16.40 on Aug 18th 2010, thus, dropping almost 3 times in this period. NSE is also planning to launch derivatives (futures and options) on this index soon. More about it here. 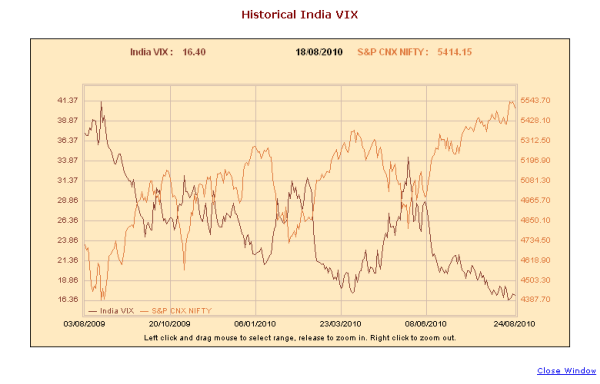 How India Vix is calculated? Before we understand how India Vix (India Volatility index) is calculated, let’s understand what is volatility and what is volatility index. Volatility refers to the amount of uncertainty or risk about the size of changes in a security or index value. A higher volatility means that a security’s value can potentially vary over a larger range of values. This means that the price of the security can change dramatically. A lower volatility means that a security’s value does not fluctuate dramatically, but changes in value at a steady pace over a period of time. The Volatility Index, sometimes referred as the fear index, indicates the volatility in the market at present or in the near future. India VIX indicates the market’s perception of the expected near term volatility. All securities portfolios as well as stock market indices are subjected to volatility and thus the studying them can be helpful because options prices are chiefly governed by the volatility in the market. 1) Time to Expiry: Time to expiry of the options contracts of Nifty that are selected to calculate the index. The time to expiry is computed in minutes instead of days in order to arrive at a level of precision expected by professional traders. 2) Interest Rate: The NSE Mibor rate of relevant tenure (i.e 30 days or 90 days) is being considered as risk-free interest rate for the respective expiry months of the NIFTY option contracts. 3) The Forward Index Level: A methodology called the forward index level is being used to select the contracts which will be used to calculate the index. India VIX is computed using out-of-the-money option contracts. Out-of-the-money option contracts are identified using forward index level. The forward index level helps in determining the at-the-money (ATM) strike which in turn helps in selecting the option contracts which shall be used for computing India VIX. The forward index level is taken as the latest available price of NIFTY future contract for the respective expiry month. 4) Bid-Ask Quotes: The strike price of NIFTY option contract available just below the forward index level is taken as the ATM strike. NIFTY option Call contracts with strike price above the ATM strike and NIFTY option Put contracts with strike price below the ATM strike are identified as out-of-the-money options and best bid and ask quotes of such option contracts are used for computation of India VIX. In respect of strikes for which appropriate quotes are not available, values are arrived through interpolation using a statistical method namely “Natural Cubic Spline”. After identification of the quotes, the variance (volatility squared) is computed separately for near and mid month expiry. 5) Weightage: The variance is computed by providing weightages to each of the NIFTY option contracts identified for the computation, as per the CBOE method. The weightage of a single options contract is directly proportional to the average of best bid-ask spread of that option contract and inversely proportional to the option contract’s strike price. Finally, the variance for the near and mid month expiry computed separately are interpolated to get a single variance value with a constant maturity of 30 days to expiration. The square root of the computed variance value is multiplied by 100 to arrive at the India VIX value. In a nutshell, from usage point of view, higher the vix index value, higher the volatility. The National Stock Exchange (NSE) will soon start derivatives (Futures and Options) on India VIX – India’s Volatility Index which is a measure on investor’s fear at a given point of time. NSE was disseminating the product since last one year which was calculated the end of the day but now NSE has started to disseminate the real time quotes as well which can be checked here. Securities and Exchange Board of India (SEBI), India’s market regulator, has given permission to the stock exchanges for starting derivatives based on volatility index. See this. NSE will be submitting the application to SEBI to start the F&O contracts based on India Vix soon. See the press release by NSE. The volatility index called the India VIX, indicates the investor’s perception of the market’s volatility in the near term. The index depicts the expected market volatility over the next 30 calendar days. i.e. higher the India VIX values, higher the expected volatility and vice-versa. I believe that derivatives on Volatility Index (India Vix) would be a good tool to hedge the risk as investors can monitor the fear factor in the market. Thus, introduction to derivatives on India Vix is just around the corner. Be ready for it.